Local grassroots organization Operation: Ceasefire KC’s attempt for a murder-free weekend in Kansas City this July was spoiled for the third consecutive year as violent crime and homicide trends continue to rise in the area. The annual event, which has a goal of inspiring a 48-hour period during which no one is killed in the city, is held to create awareness about violent crime in KC and advocate for the reduction of this by engaging community members in various events. This year the event was held from July 27 until July 29, and all areas under the jurisdiction of the Kansas City Police Department (KCPD) were considered to be in the murder-free zone. Unfortunately, the event was spoiled by two homicides reported in the KC area during the weekend. The first: a woman stabbed to death outside of her east 92nd street apartment, which occurred shortly after the event began, in the early hours of Jul. 28. The second: a man shot and killed at the intersection of 51st street and Swope Parkway in the afternoon of Jul. 29. Event organizer Ronell Bailey said that despite the deaths, Operation: Ceasefire KC’s event succeeded in creating awareness about violent crime in the city. “[We] feel it was a success because we’re not out here fighting crime, we’re out here creating awareness about violence for the young people, old people and whoever is out there pulling the triggers,” said Bailey. 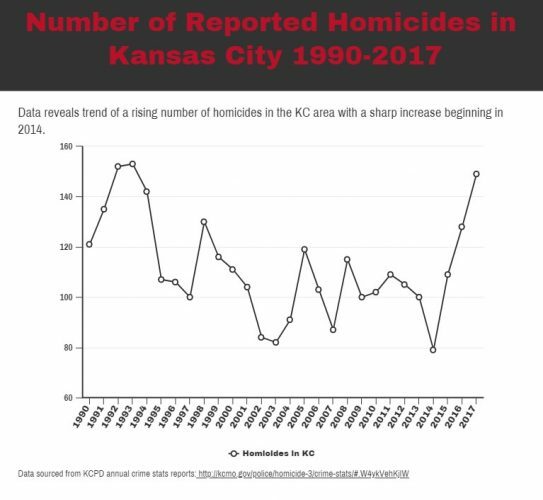 Homicide numbers have been on the rise for decades in KC, however the risk hasn’t increased proportionately across demographics. According to Ken Novak, professor of criminal justice and criminology at the University of Missouri-Kansas City, young black men are the most at risk. “It’s safer to be deployed as a soldier in Iraq than to be a young black man in Kansas City,” Novak said to KC Star last year. Nationally, reports of gun violence have been increasing and according to the Gun Violence Archive, a nonprofit organization reporting instances of gun violence in real-time, over 39,000 people have been injured or killed by firearms in 2018 alone. Trends in KC are reflective of these reports and the majority of homicides occurring in the city in recent years have been due to gun violence. Throughout the murder-free weekend, Operation: Ceasefire KC sought to bring community members together in support against this gun violence. To do this, Bailey and a team of other volunteers organized several events throughout the city. Events included a gospel concert with a youth choir on at the United Believers Community Church on Friday night, a field day with supported by the KCPD at the same location on Saturday and several barbershops giving away free haircuts all throughout the day on Sunday. While partnering with barbershops across the city is nothing new for Bailey who founded Operation: Ceasefire KC in 2016 after watching Barbershop: The Next Cut, this was the first year he had collaborated with churches and the city’s police department. “[We] wanted to bring them in to show young people that not all cops are bad and that we need to work together,” said Bailey. Organizers hope that the event will be bigger next year, and Bailey said that expansion plans include a citywide cookout with free food, speakers and live performances. Bailey also hopes to establish partnerships with a greater number of barber shops to make the events of the weekend more accessible to people citywide. Operation: Ceasefire KC alludes to a successful 1995 initiative of the same name led by the National Institute of Justice to reduce gun violence in Boston, and its actions are similar to those of nonprofits across the country. Cure Violence is an organization which regards violent crime as a disease and aims to reduce it by addressing crime before it occurs, primarily through research and community engagement in vulnerable areas. The organization was initially launched under the name “Ceasefire” and attempted several murder-free weekend events in Chicago, Illinois. Baltimore Ceasefire 365, an organization founded in 2017 with the slogan “Nobody kill anybody,” routinely holds ceasefire weekends in Baltimore, Maryland. The fourth of these events, held in May 2018, succeeded when four days went by before a shooting occurred in the city. According to statistics reported by the Federal Bureau of Investigations, annual reports of violent crime in the US have decreased since the 1990s but have been sharply increasing since 2014. Photo courtesy of the Baker Street Quarter Partnership.